I took triangular sections out of flower petals to create the elements for this design. I am not entirely satisfied with this mandala, and am not posting it for sale, but it serves as a demonstration project. I learned a good deal from the process of creating it and it opens new possibilities for me. 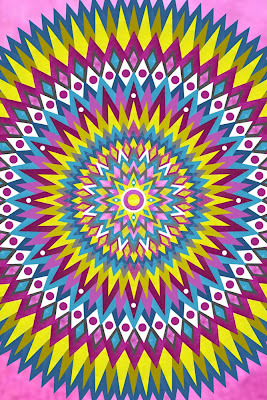 What I want to show you here is that we can take many of what I have called background patterns and turn them into overlays which can be superimposed over a mandala. By blurring the mandala, we can turn it into the backgound.